Obamacare Repeal Launched By Senate Republicans : Shots - Health News Senate Republicans introduced a budget resolution that starts the process to defund key chunks of the Affordable Care Act. President-elect Donald Trump says he'll sign a bill. 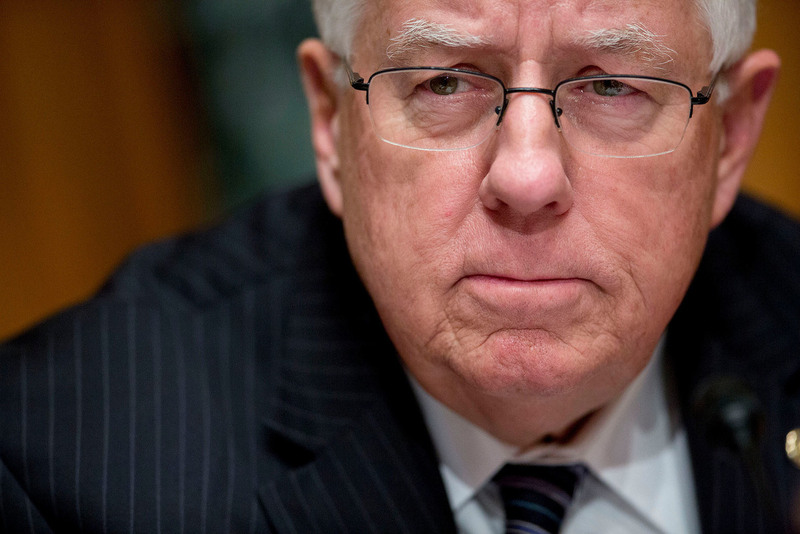 Sen. Mike Enzi, R-Wyo., chairman of the Senate Budget Committee, introduced a resolution that will serve as the vehicle for repealing key parts of Obamacare. Lawmakers returned to Washington and wasted no time getting to work on the repeal of Obamacare. Sen. Mike Enzi, R-Wyo., introduced a resolution just hours after the new Congress convened Tuesday that will serve as the vehicle for repealing much of the president's signature health care law. "Today, we take the first steps to repair the nation's broken health care system, removing Washington from the equation and putting control back where it belongs: with patients, their families, and their doctors," Enzi, chairman of the Senate Budget Committee, said in a press release on his website Tuesday. It's the first step in Republican lawmakers' plan to fulfill their most ardent campaign promise — to repeal the Affordable Care Act and replace it with a Republican alternative. Republicans have to use a special legislative maneuver, called a budget resolution, to undo the ACA because they don't have enough votes to overcome a Democratic filibuster in the Senate. Budget bills aren't subject to filibuster, so lawmakers will be able to repeal the parts of the law that have budget and tax implications. Enzi's resolution calls on the Senate to get a bill to the Budget Committee by Jan. 27. Republican lawmakers say they don't want the 20 million people who have newly gained insurance because of the ACA to lose their coverage. So they plan to phase out Obamacare over time while they devise a replacement plan that they say will make affordable health insurance available to everyone, without the much-hated mandate to buy insurance if you don't want it. Many analysts are skeptical that this "repeal and delay" strategy will work. "The most likely end result of 'repeal and delay' would be less secure insurance for many Americans, procrastination by political leaders who will delay taking any proactive steps as long as possible, and ultimately no discernible movement toward a real marketplace for either insurance or medical services," said Joe Antos and James Capretta of the conservative American Enterprise Institute in a blog published Tuesday in Health Affairs. Antos and Capretta say a partial repeal with no replacement would lead insurance companies to pull out of the Obamacare market altogether, leaving those who get coverage there today with no insurance at all. It's not clear exactly what will be included in the actual repeal bill. The best model we have now is a bill passed by the House and Senate and vetoed by President Obama last year. That bill eliminated the mandate for individuals to have insurance coverage right away but delayed the other parts of the repeal for two years. "I can see how it would be hard for Republicans to maintain the individual mandate, which is possibly the most objectionable part of the ACA in their view," says Larry Levitt, a senior vice president at the Kaiser Family Foundation. "On the other hand, getting rid of the individual mandate immediately risks a collapse of the individual insurance market." The ACA includes the mandate to ensure that both sick and healthy people buy insurance to spread the costs across a broad population and keep premiums low. If Republicans follow the model of last year's bill and eliminate the mandate immediately, many healthy people would forgo insurance, and the price of coverage for sick people would spiral out of control, analysts say. "That is a prescription for health plan disaster during this transition and brings into question just how many plans would stay in the program for 2018," says Robert Laszewski, a health policy consultant.